Pack size: 3 x 240ml flat bottles. Review Renu MPS Multi-Purpose Solution Flat Pack Great value and so easy to use, Packaging is so handy for travel. Review Renu MPS Multi-Purpose Solution Flat Pack Very satisfied with the quality of product. Super fast delivery, really good value for money. Review Renu MPS Multi-Purpose Solution Flat Pack Very good to store and wash the contact lenses. Review Renu MPS Multi-Purpose Solution Flat Pack Works well on my sensitive eyes. Review Renu MPS Multi-Purpose Solution Flat Pack Excellent price. Review Renu MPS Multi-Purpose Solution Flat Pack Handy packaging. Great value for the quantity. No problem using this solution. ReNu MPS Multi-Purpose Solution was the first all-in-one bottled contact lens solution to be used by patients, and it’s still extremely popular today. Why? Because it combines a winning formula that gently cleans, disinfects and stores all soft contact lenses (including silicone hydrogel) overnight without the need for additional cleaning products. ReNu is recommended for daily use, and should be used to store your contact lenses in nightly. Lenses can be safely stored in ReNu solution for 30 days before it should be refreshed. The ReNu MPS Multi-Purpose Solution Flat Pack contains specially designed flat bottles that will fit easily through your letterbox on delivery. Each pack lasts for 3 months and contains 3 x 240ml bottles. Going away? 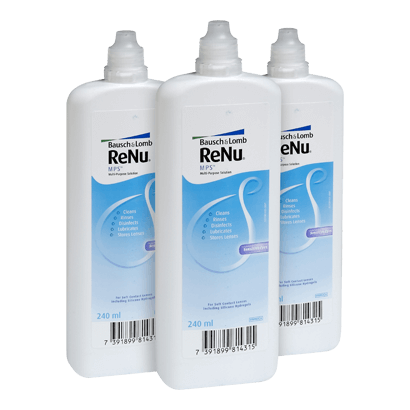 Why not try the ReNu MPS Multi-Purpose Solution Travel Pack? Designed to meet airport hand luggage restrictions, this travel pack is ideal for short business breaks or getaways.